NCAA and NFL Football Mailboxes Now Available!!! Display your team spirit loud and proud for the whole neighborhood to see by installing a great looking NFL or NCAA football team mailbox. 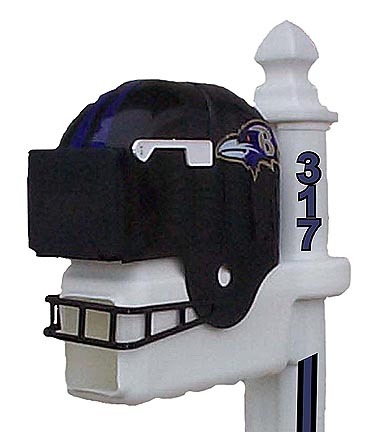 With its bright coloring and the large official NFL or NCAA football team logo on display, you’ll be sure that your mailbox will be noticed by everyone in your neighborhood. Short on gift ideas for the NFL or NCAA football fanatic in your life? NCAA and NFL sports team mailboxes are popular as gifts for husbands, dads, and huge college and NFL football fans. 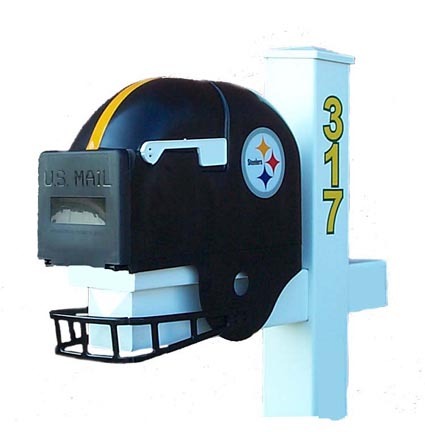 Expressing enthusiasm for your favorite NFL or NCAA team with the officially-licensed NFL and NCAA roadside mailboxes is a unique and unusual way to add that special touch. In addition, there is an accompanying NFL Sports Fan Mailbox Post with Newspaper Slot available for these decorative mailboxes. Add a decorative mailbox flag and a personalized name plate, and all of a sudden, the mailbox is something special. These Officially-licensed NCAA and NFL football helmet shaped mailboxes Constructed of high density polypropylene and are as durable as a real football helmet!